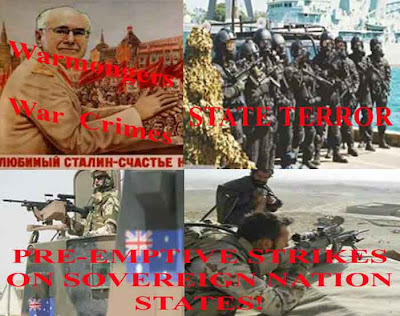 Australia's new foreign policy white paper says Australians have become targets because of the new climate of international terrorism. The policy statement says Australia's vigorous participation in the war against terrorism is vital to protect the country's long-term security. The paper says the terrorist threat from Islamic extremists has a particular edge for Australia in South-East Asia. The document says the terrorists' perverse interpretation of the Muslim faith seeks to establish Taliban-style states in moderate Islamic countries. The white paper, replacing a 1997 document, was released in Canberra by Foreign Minister Alexander Downer and Trade Minister Mark Vaile. The policy identifies four regional themes - the abiding priority of Asia, strengthening the alliance with the United States, helping with deep-seated problems of the South Pacific and dealing with the growing strength of the European Union. THE DOG: Australians have become targets because John Howard is a war criminal. Greed, the root of all evil. We suffer for Trade Sanctions off the US and we only get them if George W Bush steals the resources. Mm! But cheats never prosper! Do they? Teach our children well.